Instructions: Cut 5.5 x 5.5" card base in white cardstock. Cut, distress and adhere coral piece of designer paper from the Tulip Time Paper Collection slightly smaller than the card base. 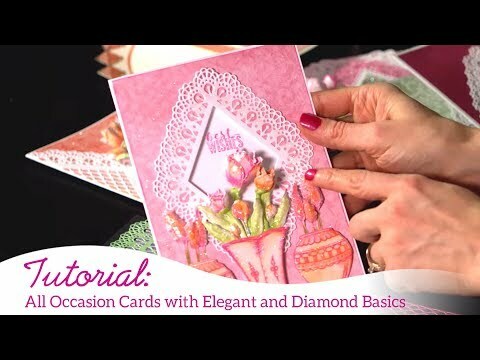 Cut the Diamonds and Lace Die in white and sponge with distress craft ink, adhere to center of card, cut a strip of corrugated cardstock 2.5 x 5.5 inches and adhere to the center of the card. Cut out the Lacey Diamond Die in white and sponge with Pearlescent Coral adhere on top of corrugated card stock, stamp the sentiment from the Thank You Sentiments Set in black on white cardstock and cut out with the Diamond Basics Die, cut out Eyelet Diamond Die in white card stock and sponge with Lulu Lavender ink, layer the sentiment on the Eyelet Diamond with foam tape. Stamp the small Oakberry Lane Blossoms in Lulu Lavender and Pearlescent Coral, cut out with corresponding dies, and sculpt with the 3D Blossoms Shaping Mold, add lavender and magenta bead stamens to the centers. Sponge blossoms with adhesive and cover with Crystal Clear. 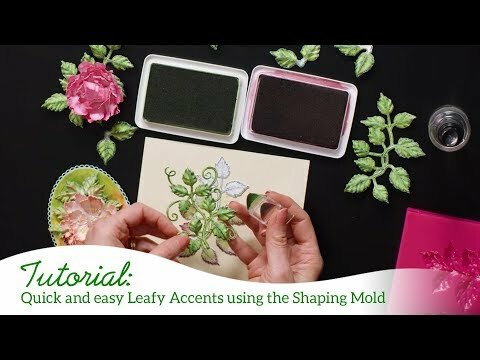 Stamp, and sponge leaves from the Leafy Accents set in Bamboo Leaves, Pearlescent Coral in the centers of the leaves, cut out with corresponding dies and sculpt with the 3D Leafy Accents Shaping Mold.